The Mines Press has all the 1099 forms to help you meet IRS filing requirements and are guaranteed to be compatible with your tax software. The one tax form that is used most frequently is the 1099-MISC for payments to independent contractors. This form must be submitted for any payments totaling more than $600 to any one contractor for the year. What is a 1099 Tax Form? 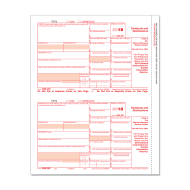 1099 Forms are a series of documents the Internal Revenue Service (IRS) refers to as "information returns." There are a variety of different 1099 forms, each reporting a different and specific type of income you may receive throughout the year, other than the salary your employer pays you. A 1099 is similar to a W-2 in that they both report income and both are considered “information returns." However, a W-2 reports wages, salaries, and tips, and a 1099 reports payments made in the course of a trade or business to a person who is not an employee, or to an unincorporated business. 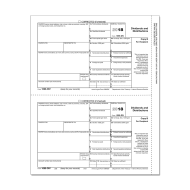 The tax form most commonly used for independent contractors is the 1099-MISC. 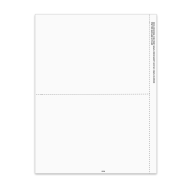 This form must be submitted for any payments totaling more than $600 to any one contractor for the year. Your business will be responsible for issuing the respective 1099 forms for the tax year, and will be held accountable if all of the IRS requirements and regulations are not fulfilled. Explore our collection and find all the 1099 tax forms you need!